Now through November 1st thousands of families, dressed in their latest Halloween costumes, visit the Magic Kingdom. Celebrating Halloween with Mickey Mouse would not be complete without attending Mickey’s Not-So-Scary Halloween Party held on select nights. The event is a lot of fun but we do not recommend it for first time visitors to the Magic Kingdom. The park will be crowded and there is no way you can go on all the rides even if you arrive as of 04:00 p.m. which is the time Disney traditionally let’s guest enter even though the official festivities do not start till 07:00 p.m. If you’ve never experienced the classic rides the park offers this is not for you. There is an overwhelming number of Halloween special events going on and part of the fun is to absorb the ambiance, look at the outstanding decoration and get the trick-or-treat bags of the kids filled. This being said with a little planning and a realistic approach everybody in your party will have a wonderful time. The event is a great treat for return visitors and those who celebrate all things Halloween. 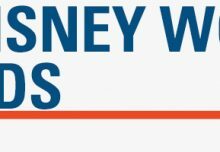 First Things First: Mickey’s Not-So-Scary Halloween Party is an annual event at the Magic Kingdom that runs 07:00 p.m. till midnight on select nights from mid-September through November 1st. If you will be visiting with small children an afternoon nap might be a good idea. Fright factor: The events are geared towards young children. Disney cleverly shows the spooky side of Halloween but at the same time makes sure that little tikes get just the right dose of fright —without terrifying them. You will not encounter monsters and there are no vampire or chainsaw-swinging zombies scaring guests. 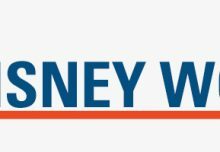 Important to know: Even though it’s not officially announced anywhere, Disney will start letting guests with tickets for the party into the park as early as 04:00 p.m. (instead of 07:00 p.m.) There is a special entrance for ticket holders and you will receive a special event wristband and your trick-or-treating bag. This is a great way to enjoy the park before the party starts. Square away your favorite rides and have dinner before enjoying Mickey’s Not So Scary Halloween Party. Upon entering the park you should arm yourselves with the special events map—better yet download the map in advance of your visit—and study it before you even get to the park. Decide which events are a must and agree with all in your party what you will be doing and when. Trick-or-Treat: Over 240 tons of candy is distributed annually, and it is given generously. There are two special trick-or-treat trails and eleven stations throughout the park featuring some great candy including favorites such as mini Snickers, Mars, lollipops, Tootsie Rolls and even Werther’s Caramel Apple candies at Pinocchio’s Village House. If trick-or-treating is what your kids enjoy most, bring an extra bag or a backpack in which to empty your loot regularly. The trick-or-treat bags distributed by Disney are rather small. For children with dietary or allergy restrictions, candy can be swapped out at City Hall for sugar and nut-free treats. Sorcerers of the Magic Kingdom Trading Card: For every special event Disney issues a special edition of the Sorcerers of the Magic Kingdom trading card. If you are a fan of the game go and get yours as soon as you arrive. 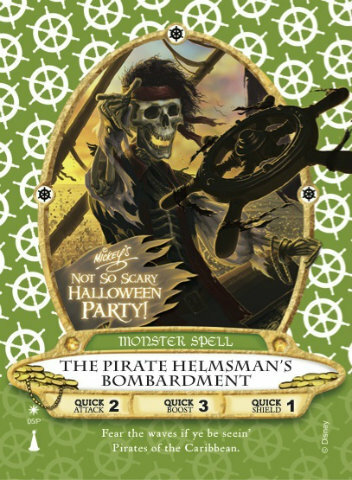 Guests with wristbands can pick up the card at the Firehouse on Town Square and at the distribution spot behind Ye Olde Christmas Shoppe as early as 04:00 p.m.
Not often seen characters are out to haunt you: Usually I visit the Haunted Mansion first. 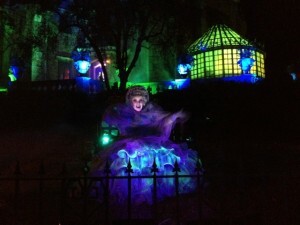 While it is not decorated differently inside the mansion, the lawn looks spooky and is taken over by Lady Carlotta, one of the 999 happy haunts of the Haunted Mansion. She is hilariously funny and lifts the dreary mood your little one might experience prior to entering the Haunted Mansion. At times Ms. Renata Dubois, her sister and one of the twirling ghosts inside the mansion’s dinner scene, makes her own appearance. Little tikes enjoy stopping at Town Hall and visiting with Mickey and Minnie, who are dressed in their Halloween costumes. Jack and Sally the characters from The Nightmare Before Christmas are another favorite of mine and they can be found on Town Square right next to Guest Relations. 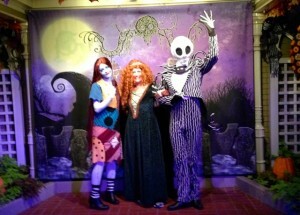 If Jack and Sally are a must, I recommend you stand in line as of 06:30 p.m. or you try just before the second Boo-To-You parade starts. Boo-To-You: A great excitement goes through the waiting crowd when the Headless Horsemen rides past and the lights of the Magic Kingdom are dimmed. He is a must-see and for me, together with the Gravediggers of the Haunted Mansion, the highlight of the entire parade. The Boo-To-You Halloween Parade begins in Frontierland at 8.15 pm and then again at 10.30 pm. While it’s easier to get a great spot for the second parade, it’s important to keep the ever-changing Florida weather in mind. If the second parade is cancelled due to inclement weather you will have missed the best event of the entire evening. Showtime at Cindy’s Castle: The Disney Villains’ Dance Mix and Mingle! show in front of Cinderella Castle is a lot of fun, and if your kids love meeting the villains, especially the rarely seen Queen of Hearts and Dr. Facillier, this is your show. The show is staged at 07:45 pm, 08:50 pm, 10:05 pm and once more at 11:15 pm. 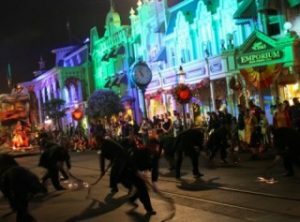 Find a spot that will let you see the first show and when turning around will put you right along the parade route and wait for the first Boo-To-You Parade, which is held at 8:15 PM. 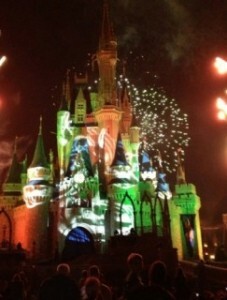 After the parade I stayed put and waited for the 09:15 pm Celebrate the Magic show and the 09:30 p.m. HallowWishes. The fireworks are simply spooktacular and an absolute must-see. 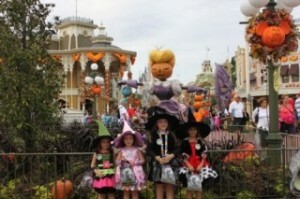 At this time many guests, especially those with very young children start leaving the park and now is your time to check out the trick-or-treat stations. A treat for Happy Feet: Two dance parties are held simultaneously and kids will love it! Mike and Sulley are the stars at the Monstrous Scream-O-Ween Ball dance party held on the Rocket Tower Plaza in Tomorrowland. New this year is Club Villain at The Diamond Horseshoe in Liberty Square. Here evil is ready to boogie the night away. Got a costume? If not for Halloween, when will you clad yourselves and your entire family in costumes? I have been seen as a witch, Princess Merida and have lately succumb to the Frozen craze. I love to observe the other guests and admire the creativity of so many. Shop till you drop: Needless to say that there is plenty of Halloween themed merchandise and lots of spooky treats out there. 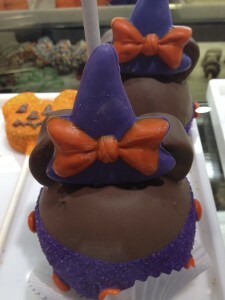 My favorite are still the caramel apples but I must admit that some of the cupcakes such as the bat or ghost cupcakes were some of my new frightening finds. 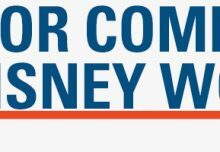 Ready – Set – Go: Keep in mind that the weather in Florida at this time of the year can still be very warm and dressing your little one in a pumpkin, Tiger or furry Sulley costume may not be the best choice. If you plan to stay for the entire party be aware that it will require a lot of walking. Your little princes or princesses will be well served with an afternoon nap prior to the festivities. Take a stroller and your Cinderella will probably be very grateful to have her own coach once you leave the parks. Plan an easy activity for the next day, enjoy your resort pool or any of the Disney Water Parks. At all times stay hydrated and have fun.